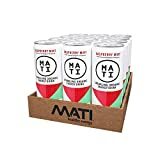 MATI Energy Drink is a unique energy drink that uses brewed guayusa leaves as its caffeine source. 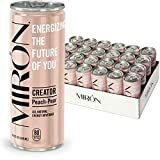 The manufacturers state that the caffeine per can is equivalent to 1.5 cups of coffee, which is highly subjective. 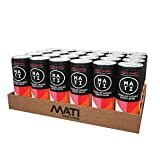 However, we recently heard from the company and their definition of a cup of coffee is 70 mg and stated that MATI contains 100-110 mg of caffeine per can. MATI was first developed by a college student from North Carolina and has since become a nationwide brand. MATI also contains real fruit juice and contains no additional sugar. In addition to caffeine, guayusa also supplies antioxidants and potassium to the drink. 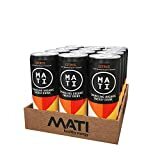 Even though MATI Energy Drink in all natural, it still should only be consumed by healthy adults only. Sugar content: 11 grams (per 12 ounces). 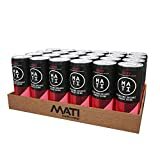 MATI Energy Drink contains 9.17 mgs of caffeine per fluid ounce (31.00mg/100 ml). Data Sources: https://www.matienergy.com and an email from the company.